My opinion on real estate agents is that, as a whole, they are about 25% as useful as they were before the internet came along. That is not to say the best agents are not 100% or even more valuable than they once were, but the simple truth is that people need less from their agents nowadays because buying or selling a home can involve a degree of self-service that wasn’t practical or possible in the past. The last time I sold a home, my agent listed it on the MLS, did a couple of open houses and then let it sit. I ended up then hiring my friend to take over and he more or less did the same thing but took less commission. The condo eventually sold after 8 or 9 months but it was only because a buyer found it themselves, online, and decided to purchase it. Similarly, the last time I bought a condo, I found the place off-market, via a friend, and negotiated the purchase myself — directly with the seller — and all my agent-friend did was charge us about $1500 to write up the contract. I ended up getting the condo for about $400,000 (substantially under market) and the seller got the equivalent of selling it for $425,000 if we had agents involved. Finding off-market properties because of their connections in the neighborhood. Driving me to properties that I find myself and letting me in. Writing up a purchase and sale agreement (99% of which is just a form letter). Are any of those worth a full 3% commission? To me, #1 is, #2 may or may not be depending on if you end up seeing one place or 30 places, and #3 certainly isn’t. That said, I am not up for signing an official buyer’s representation contract with an agent at this time. If an agent lets me into one property that I found by myself and I end up buying it, that agent should refund me all but a grand or two of the commission. If, however, he/she brings me an off-market property or ends up spending a lot of time on my account, go ahead and take the full commission. Unfortunately, typical real estate contracts do not accommodate this sort of arrangement so I’m staying contract-free for now. A real estate agent friend of mine has agreed to show me around any places I find as well as keep a lookout for off-market properties without officially engaging as my agent, so this is how we’re moving forward for now. With regard to searching for properties yourself, it all comes down to one acronym: RSS. Setting up a saved search on your local real estate site (I use Windermere) and consuming the results via RSS ensures that you find properties the minute they hit the Multiple Listing Service. RSS is so quick that often you’ll see a listing before photos of the property are even uploaded. If you’re not up for RSS, at least choose to get your saved search results via e-mail. There’s no excuse for missing a single property when you use saved searches. I called him back to confirm my availability and get a quick overview of what we were going to be looking at. 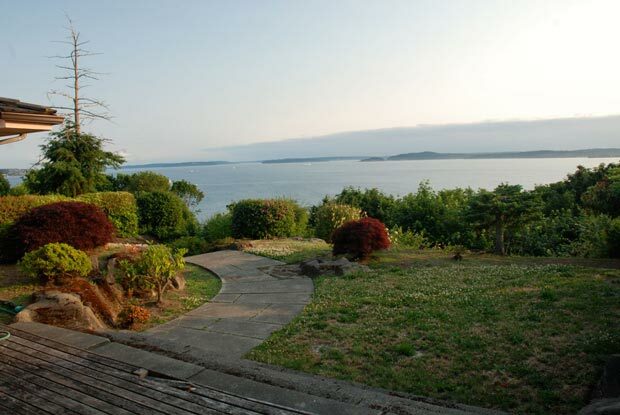 Apparently, it’s an estate sale, hasn’t been lived in in a couple of years, needs quite a bit of work, but sits on a large lot with a jawdropping view of Puget Sound. It is currently being prepared for market, but the sellers (four beneficiaries) have not signed on with an agent yet or communicated a price. 45 minutes later, we met my agent several blocks from the property and drove over in one car. Upon arriving, the first thing that struck me is that the house is only a few steps away from one of the nicest parks in Seattle. I don’t spend a whole lot of time in parks, but it’s certainly a nice amenity to have at your doorstep. The house itself — from the front — was quaint in its own way but unremarkable. Built in the early ’50s, it was conceived in what I would consider an architectural dead spot: right between the brick Tudors of the ’30s and ’40s and the wonderful mid-century moderns of the late ’50s and ’60s. It has a carport instead of a garage, sits very low to the ground, and is covered in a combination of old-growth wood and period-popular stone siding. Entering the house exposed right away both the greatest and worst things about it. On the great side, the view is about as spectacular as I’ve ever seen in Seattle. It’s a full 180 degree Puget Sound view spanning from Alki beach to the south all the way past the north point of Bainbridge Island to the north. Almost as amazing as the view itself is the fact that the backyard drops right off a 300 foot cliff so no one can ever block your view. Additionally, the house is completely separated from its neighboring structures on both sides by beautiful foliage. The view facing west before sunset. Apparently, bald eagles perch on the tree to the left. On the bad side, however, the layout of the interior squeezes four levels into two stories, one of which is a daylight basement. Essentially, there is the daylight basement, then two bedrooms a half floor up, then the main floor another half floor up, and then two more bedrooms another half floor up. Because of all the half floors and the staircase that connects them — right down the middle of the house — the great room and other areas are chopped up a lot smaller than they could be. Without that staircase and one of the levels, the great room could be 2-3x as roomy and open. Additionally, although the house is in fine shape, it hasn’t been updated much at all since it was built. With the above and about 100 other considerations and details in mind, this house is the first house I’ve seen which feels unconditionally like a place I could live in for the rest of my life. Much better than the last house and also the first house. While at the house, I got to meet the seller. He is one of the four beneficiaries of the estate and the one officially handling the sale of the house. He’s an attorney (as were his parents and as are two of his siblings!) and a really down-to-earth guy. I asked him for some historical stories about the house and he told me that he had lived there from age 5 or 6 all the way up until college. He also showed me a great Sony reel-to-reel tape player and phonograph from 1960 which still sits in the living room. I told him if I ended up buying the house, I wanted to showcase that stuff in the new living room. In talking to the seller, I could tell this had been a special house to a lot of people and it was a tough decision for the family to sell at all. After we left the house and my girlfriend and I discussed it for a few minutes, the question wasn’t if I would make a bid, but instead how and for how much. The seller hadn’t signed on with a selling agent yet and was still auditioning several of them, so there was still a possible opportunity to save him some sell-side commission and thus get the house at a lower price. I’ll be writing up an offer of some sort tomorrow. So psyched. Before showing up at the property yesterday, I asked my real estate agent what he thought the seller wanted for the place and he gave me a low price and a high price with about $200,000 of room in between them. When I was at the house, however, I saw some literature a prospective selling agent put together for the seller which suggested a number at the higher end. My agent thought I should bid close to the middle of the range, but once again, I do not find myself agreeing with this advice. Since the middle of the range is the absolute most I would pay, I think it’s best to start low and move up if necessary. I still haven’t heard an actual price directly from the seller, so for all I know, if I do this deal in cash and waive a bunch of contingencies, I can get it for substantially less than even the seller was thinking. Maybe it will fly and maybe it won’t, but since three out of the four beneficiaries are attorneys, I can’t imagine they wouldn’t be up for some negotiating! That in mind, I’ve decided to put my first offer in at $100,000 less than the bottom of the range my agent gave me, $300,000 less than the top of the range, and $150,000 less than what I’d feel 100% comfortable with. The offer is easy to justify, especially when using the first prospective house that I didn’t get as a comp. I’m writing in no contingencies (not even financing) except for a quick geotech inspection and hoping that the seller will value a quick close to a solid buyer who really wants to make the place shine again. If I were the seller, I would favor selling to someone who actually wants to live there instead of a developer. Also, it’s well known that end-users like me will generally pay more than developers for properties like this because our time horizons are far longer and we’re not in it for the profit. I do not expect this first offer to be accepted, but I do expect it to be a starting point. The problem wasn’t the response, but rather the lack of additional comment or counteroffer. The situation is weird in that the prospective selling agent who was at the house works in the same office as my agent and he wants this deal to go through him even though he is not the agent of record with the seller. I have a problem with this as, for all I know, the seller has no intention of signing on with this guy. To put my fate in the hands of a selling agent who hasn’t even been retained by the seller yet seems crazy and risky. Hearing that response convinced me that I needed to engage directly with the seller. I’m not going to let this deal get away because someone is trying to get in the middle of it. I enjoyed meeting the seller at the house, and he’s a professional negotiator (attorney), so I don’t see why we can’t negotiate directly. I will be calling him this evening to see what his thoughts are. After a marathon day of golfing for charity, negotiating, driving, and executing documents, we finally have a deal!!!. In the end, I agreed to pick up my agent’s commission and also indemnify the seller against any claims or lawsuits coming from the real estate agent he didn’t sign on with, and he agreed to put a clause in the contract which allowed for reasonable extension of our closing date if circumstances beyond my control prevented closing by the official closing date of July 31st. This clause was very important to me as I waived my financing contingency and put $100,000 down in earnest money. If some shmoe at a bank fat-fingers a few keys and causes this thing to close on August 1st instead, I don’t want my earnest money to be at risk. The indemnification thing is a bit of a calculated risk for me. Essentially, this other agent feels he should be compensated as the selling agent even though he was never retained by the seller. I have worked out a deal with my agent to pay this agent a .5%-of-selling-price referral fee out of his commission so everything should be good, but I understand why the seller would ask me to indemnify him. I don’t like having to do it and I don’t think any lawyer would advise anyone to ever do it, but I figure the chances are tiny that it becomes an issue, and even if it does, the amount we’re talking about is just 3% of the sales price. It’s not a trivial amount, but it’s not millions of dollars either. I will just have this other agent sign a release form before releasing his referral fee from escrow. Since both my agent and the real estate office that they both work for have confirmed to me that he has no claims to any commission, I’m not worried about it. As for the deal itself, it was signed about an hour ago, at around 11pm and I’m still in shock that it came together. The seller and I both drove out to the real estate office, and as I was waiting for him to show up, I honestly thought that there was a chance he was going to take our signed offer and just sit on it over the weekend as the property went on the market. To his credit however, he read over the deal, faxed it immediately to his sibling that was the executor of the family trust, got it signed and faxed back, and congratulated me on being the new owner of their beloved home. It’s such a great feeling to have made it through this process. By taking matters into my own hands and not allowing myself to be governed by the customs of the real estate industry, I have a once-in-a-lifetime house at a great price from a great family. The stress isn’t over quite yet though. I have five business days to do the geotech inspection to make sure this house isn’t about to fall off the cliff and only a few weeks to close financing. Posted in Milestones, Negotiations, Property Procurement, Real Estate Agents | Comments Off on Over the Goal Line!